HP Deskjet F2180 is a multipurpose printer which is designed specially for home-oriented printing needs. The printer comprises an all-in-one software efficient in printing, scanning and copying. It is a good choice for those who are looking to manage their daily printing needs from the comfort of home. The HP Deskjet F2180 Ink Cartridges make the printer viable for both black and white as well as colour printing. The printer provides sharp quality photographs and texts. For a better user experience, the photos can be printed and copied without the necessity of a computer. It prints and scans with a resolution going up to 1200 dpi. It sustains long-lasting high quality prints that are perfect for family photos. HP Deskjet F2180 has all the basic requirements that are needed for a quality print. Its capacity for producing black and white print goes up to 20 ppm. For colour printing the speed is 14 ppm. The sheet capacity of the input tray is 100 which is considered good for home users. The printer has an extended print durability due to the HP Deskjet F2180 Ink Cartridges. The printer provides a USB slot that helps in transferring files easily. The standard memory is 32 MB. It is compatible with windows and Mac systems. The HP Deskjet F2180 is a printer perfect for home or home office users. The best part of the printer is its multi functionality that enhances user convenience at a good price. If you are looking for a printer that suits your day-to-day family printing needs then HP Deskjet F2180 would be an ideal choice. Q. I would like to purchase HP Deskjet F2180 Ink Cartridges in bulk. Can you provide any guidelines on storing these cartridges? Install the cartridge on or before the Install by date, which is printed on the cartridge package. You should keep all unused print cartridges in their original sealed packages until they are needed. The cartridges should be stored at room temperature (15–35 degrees C or 59–95 degrees F). If you have removed it, do not reattach it. Doing this will damage the cartridges. Q. What is the input tray capacity of the HP Deskjet F2180 printer? A. This printer can contain 100 sheets of Legal and Plain paper. Q. What is the use of ink-backup mode on the HP Deskjet F2180 printer? A. The ink-backup mode help to operate the printer with only one print cartridge. The ink-backup mode is used when a print cartridge is removed from the printer .Printing in ink-backup mode slows the HP All-in-One and affects the quality of printouts. Q. What is the maximum printing resolution that the HP Deskjet F2180 printer can support? A. The HP Deskjet F2180 printer has a maximum resolution of 1200 dpi in monochrome printing and 4800 x 1200 dpi in colour printing. Q. What operating systems are supported by the HP Deskjet F2180 printer? In Windows OS, Windows 2000 and greater. In MAC OS, Mac OS X 10.3 and greater. It also supports LINUX OS. Q. Will there be any additional charges if I order HP Deskjet F2180 Ink Cartridges cartridges from this site? A. All our orders include some delivery charges that start at €1.99 inc. VAT. The delivery charge of the product may vary according to its weight. Q. What is the monthly duty cycle of the HP Deskjet F2180 printer? A. HP Deskjet F2180 has a maximum monthly duty cycle of 500 impressions. Q. An error message saying “Used or Counterfeit ink cartridge detected” keeps showing on my computer screen when I try to print. I have just installed the new ink cartridge. Why does this message appear and how can I check and change the cartridges if required? A. The used or counterfeit ink cartridge detected message may appear on the screen when you are not using good quality cartridges or the cartridges that you have been using are low on ink or have already been consumed. (But this will not stop your printer from printing.) If your cartridge is not low on ink, just click on No/ OK/ Continue. Doing so will dismiss the message. You can continue printing soon after that. If the ink cartridges have been consumed then you will have to replace the cartridges. Firstly, check the levels of the ink through the printer software. If any of the HP DESKJET F2180 ink cartridges are empty, then the machine will keep on showing the error message until you replace it with the new ones. Q. What are the compatible HP DESKJET F2180 ink cartridges? How are they different from the original cartridges? A. A compatible cartridge refers to an ink cartridge that is not manufactured by the original manufacturer of your printer but functions and works in the same way that an HP cartridge does. Compatible cartridges are popular with consumers because of the lower cost to purchase, compared to cartridges produced by the original manufacturer. Q. 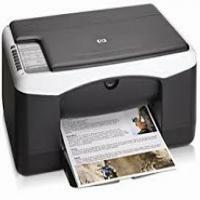 Does HP Deskjet F1280 support printing from a mobile device? A. No, this printer does not support printing from a mobile device. Q. How can I check ink levels for my HP Deskjet F2180 Ink Cartridges? Click on the estimated ink level tab. The estimated ink levels for the print cartridges will appear. Q. Does HP Deskjet F2180 has scanning feature? A. Yes, it is an All-in-One device that supports scanning, printing, and copying.